Pull up to the Old Faithful viewing area and there is a parking lot the size of a mall. Find your spot and then walk down the sidewalk to the HUGE amphitheater with gift shop and museum. Inside the amphitheater, there is a viewing area with panoramic views of Old Faithful – well, there would be if there weren’t 500 other people standing in the way. There is a sign in your face every 5 feet telling you when the next eruption will be. During the eruption (which is, admittedly, pretty cool), you are hard pressed to even see the full thing for all of the people trying to hold their camera the highest possible so they can get a picture over everyone else’s heads. Well, eventually, you are just going to be taking a picture of the sky. Lone Star Geyser: A True EXPERIENCE! So those of you who have followed us a while know what we are all about. We like to find the things that no one talks about, that aren’t as popular, the road less traveled. We are a different breed. We don’t settle for ‘good enough;’ we want to see the best that the world has to offer! So after seeing Old Faithful, we knew we had to find something more exciting. We had heard of another geyser that was out in the forest; just a short hike away. So we found the trail and hiked the 3 miles in to the Lone Star Geyser. This geyser is out in the middle of the forest and is a sight to see! After the 3-mile hike, you emerge to an opening and there is a 9-foot tall geyser just out in the middle of the forest! 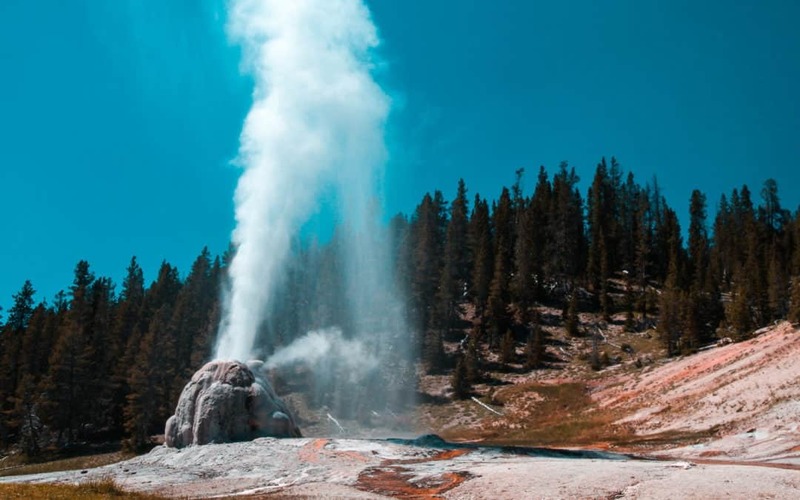 The Lone Star Geyser erupts about every 3 hours. We had arrived just about an hour after the last noted eruption (there is a handwritten log where hikers note what they saw when they were there). We stayed for about another hour and a half and watched the geyser evolve from steaming a little to “splashing” to a minor eruption. While we didn’t stay for the major eruption, they minor eruption was more thrilling than the full eruption at Old Faithful! The minor eruption sprayed about 20 feet in the air and was noted that it could get as high as 45 feet! Not only was the eruption of the Lone Star Geyser more spectacular than that of Old Faithful, but I must also note that we were the ONLY people there for the first hour. One other group of hikers arrived just before the minor eruption, so during the eruption there were SIX people there. I’d call that a successful experience! After seeing Old Faithful, Lone Star and several other smaller geysers in Yellowstone, we can safely say that the best experience was by far at Lone Star Geyser. The 3-mile hike is an easy hike on an easy path with very little elevation gain, and it is totally worth it. So if you are planning a trip to Yellowstone National Park, don’t skip out on this one! Don't forget to check out the Driving Tour of Yellowstone National Park for wildlife viewing as well! For more of our honest opinions on our adventures, be sure to subscribe below! Check us out on Instagram for more pictures! Until next time, Live Vicariously!